Can you confirm these amateur observations of Pelusios rhodesianus? Type locality: "Mpika District, northeastern Rhodesia" (= Zambia). Comment Distribution: For maps see TTWG 2014 and Kindler et al. 2015. Etymology Named after its occurence in (Southern) Rhodesia, now Zimbabwe. Bour,R. 1983. Trois populations endémiques de genre Pelusios (Reptilia, Chelonii, Pelomedusidae) aux îles Seychelles; relations avec les espèces africaines et malagaches. Bull. Mus. Natl. Hist. Nat. Paris (4) 5: 343-382. Raw, L.R.G. 1978. 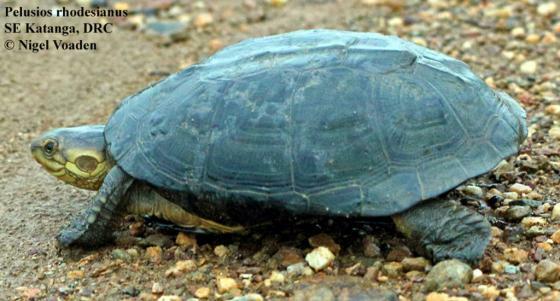 Taxonomic notes on the hinged terrapins, genus Pelusios, of Natal (Testudinata, Pelomedusidae). Durban Museum Novitates 11 (17): 287-294.